Prime Minister and Minister for Finance Gaston Browne yesterday presented to the House of Representative his government’s Fiscal Estimates of Revenue and Expenditure for 2019. Commonly referred to simply as ‘The Budget’, Browne unveiled a package comprising expenditure of $914.9 million in recurrent spending and capital spending of $130 million – making a total well in excess of $1 billion in projected expenditure. On the revenue side, the budget projects to rake in $932.2 million in recurrent intake and $34 million in grants, for a total revenue of$966.2 million — leaving an overall financing gap or deficit of $78.8 million. The Prime Minister, a career banker before entering elective politics about 20 years ago, explained what this meant and how the financing gap would be bridged. “Additionally, total principal payments amount to $360.1 million. This, along with the $78.8 million overall deficit and the $10 million allocated to reduce arrears to local contractors and suppliers, bring the financing requirement for 2019 to $448.9 million. To satisfy this requirement, our Government will raise $274.8 million from Securities issued on the Regional Government Securities Market, and access loans and advances of $174.1 million,” he stated. 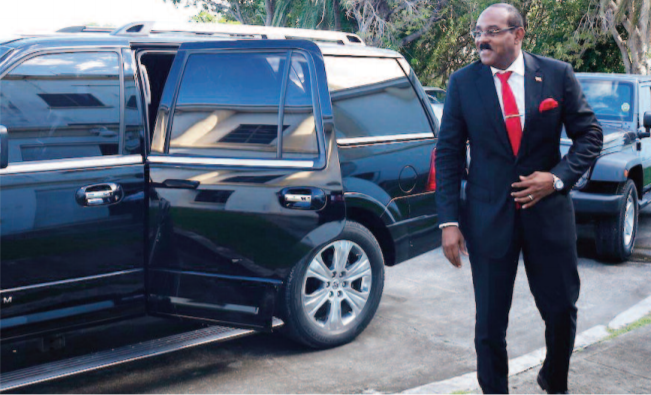 Despite presenting a deficit budget, not for the first time, the Prime Minister highlighted what he said was yet another period of robust economic growth for Antigua and Barbuda. His employment statistic will likely be questioned or debated by others less convinced, but Browne declared that “several thousand new jobs have been created between 2013 and 2018, and a further 2,000 jobs will be added in 2019.” Further, that “growth in per capita income increased from an average of $36,569 between 2009 and 2013, to $43,268 between 2014 and 2018,” – a reference to the last term of the previous UPP administration, compared with the first term of his current administration. Stayover and cruise tourist arrivals were at record levels, he asserted, as well as increases and expansions of the hospitality plant (hotels and restaurants), which had in turn fueled and 8-percent growth in construction, with attendant surges in indicators such as cement sales. Occasionally conceding that the reality was not always as rosy as the figures might sometimes appear to suggest, Browne added that “despite economic growth of more than 5 percent in 2018, the government recorded a current account deficit of $36 million in 2018. Acknowledging the assistance of friendly foreign states, he disclosed to loud applause that “The Government of Venezuela has agreed to write-off 50 percent of the debt owed to PDVSA for fuel imported under the Petro Caribe Initiative. This debt write-off amounts to $250 million. The Prime Minister said that based on projections by the Eastern Caribbean Central Bank, 2019 is expected to produce further economic growth exceeding 5-percent, but his government was aiming to surpass even that and return a performance of at least 6-percent.